There are several churches in Brussels worth visiting. The largest of them all is the Basilica of the Sacred Heart, but that is not the nicest one. 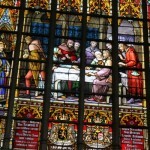 Here you can read about some other beautiful churches in Brussels we wouldn’t miss for the world. This church is very close to the central train station in Brussels. It has two twin towers easy to see from most areas of Brussels. The inside of the church is amazing and this is where royal weddings and funerals are held. They started the construction of the church in the 13th century, and today you can for example see a preaching throne from the 17th century. Not far from Eglise Saint Jacques sur Coudenberg you can find Eglise Notre-Dame du Sablon. The church has a beautiful architecture, and it might in fact be our favorite church in Brussels. 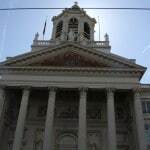 There are several other churches in Brussels as well, but these are our favorites.